Another Flag Piece for 4th of July Weekend! 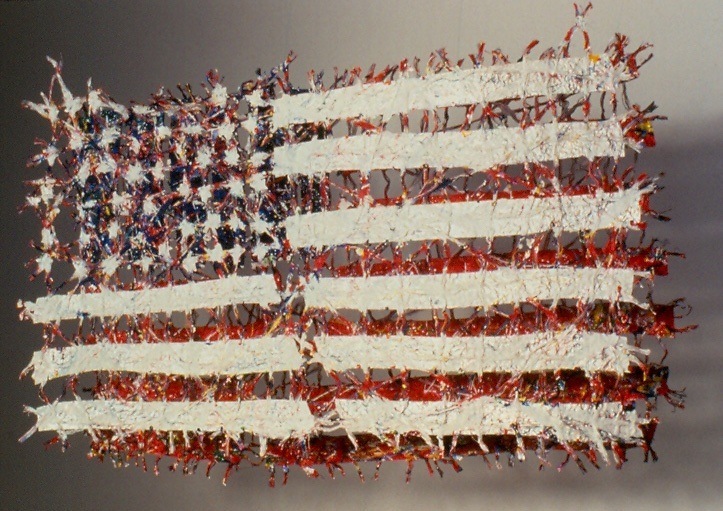 I created a series of flag pieces back during the era when the USA began all those awful wars in the Middle East. This artwork is also mixed media on handmade paper with string and is suspended from the ceiling with the 2 pieces about 1 foot apart. This photo shows my handmade paper mixed media artwork titled “Blowin’ in the Wind” commissioned by ASCAP in 1992 and installed in their boardroom at Lincoln Center, NYC. Have a great USA Independence Day!